African Cities Test The Limits Of Living With Livestock : The Salt Hipsters may just be discovering the joys of backyard chickens, but in African megacities, people have been bringing their animals into the slums with them for decades. That's creating a new ecosystem of animals and huge numbers of people living closely together like never before. 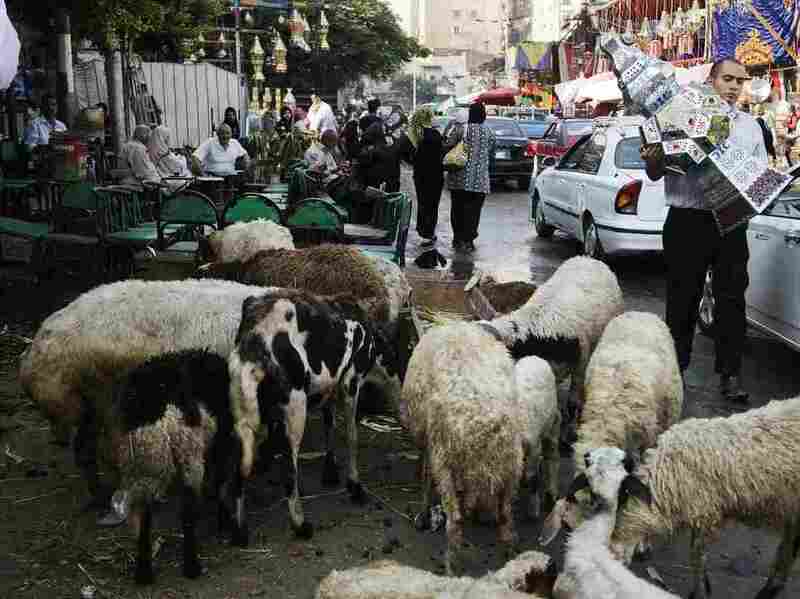 Sheep graze in the street last year in Cairo. Raising chickens has become so fashionable among some urban Americans that there's now a market for chicken diapers, as we reported this month. For a bit of a reality check, let's consider what it means to raise urban livestock in the developing world, where people are poorer and hungrier, and cities are much more densely populated. It's a starkly different picture of people and animals living together, and the question of how it's done has major implications for improving food security and preventing public health disasters. While humans have been raising food animals in their homes for thousands of years, what's different now is that they're doing it with so many other humans crammed next to them. And they're not just feeding their families: They're feeding their neighbors, too. Worldwide, 34 percent of meat and nearly 70 percent of eggs are produced in urban areas, according to a 2008 report by the World Bank and the Food and Agriculture Organization. In Maputo, Mozambique, for example, a city with about 1.2 million people, 37 percent of households produce food and 29 percent raise livestock. "Those moving from rural areas to the cities are bringing their livestock with them, often keeping them in close confinement inside the slums," Delia Grace, a veterinary epidemiologist and food safety specialist, tells The Salt. "People keep livestock like chicken, ducks, goats and even cows because there's huge demand for them, and they're profitable." Grace, of the International Livestock Research Institute in Nairobi, Kenya, is studying these huge new city ecosystems. In a series of papers she's published in the past several months in various scientific journals, she has looked at the risks and benefits of urban livestock in the developing world. When it comes to risks, Grace says she's most worried about what happens to the animal waste — especially in places where human waste isn't even managed well. And she's worried that sick animals that go untreated lead to zoonoses — diseases that spread from animals to humans. One of her recent studies, published in the journal Tropical Animal Health and Production, found that zoonoses and diseases recently emerged from animals make up 26 percent of the infectious disease cases in low-income countries. "We're talking about the everyday events of disease spreading from animals to humans, and the rare but more serious event of the emergence of a new disease," she says. "Slums could be a good test tube for growing new pathogens, because people are poor and malnourished, and there's generally just more disease." Meat and eggs produced in slums also pose a food safety risk, she says. "There's often no refrigeration or cold chain for these products," she says. But even with the risks, Grace argues there's a net benefit from people keeping urban livestock, and cities should be trying to help producers learn how to safely care for their animals and the food they produce. According to her research, urban livestock generate income and improve the nutrition and health of communities they're in, because the animals are a source of fresh food for local consumers. When cities try to ban urban livestock, it backfires, she says. "We found that the more people were harassed by the police about their animals, the fewer precautions they took," she says. Pierre Ferrari, CEO of Heifer International, a nonprofit that targets hunger and poverty by supplying communities with livestock, agrees that urban livestock can be a tremendous nutritional resource for the poor — if waste is well-managed and veterinary care is available. "Nutrition is more important than calories, and animal-based foods are very high-quality, nutritious food," he tells The Salt. "But you also need good nutrition for the animal, and many people are not in the position to keep a cow well fed, which is why we recommend smaller animals, like goats, sheep, rabbits and guinea pigs." According to Ferrari, two of Heifer's most successful urban livestock projects include a guinea pig operation in Cusco, Peru, and a community in Accra, Ghana, that produces grasscutters, rodents prized there as a delicacy. "These animals use feed very efficiently, and you can keep them in relatively small cages," says Ferrari. In fact, Ferrari recommends guinea pigs over chickens to just about anyone living in cities. Listen up, hipsters: Guinea pigs may one day need their own fashion line, too.